For the mountain house, I want the bathrooms to feel minimal but still editorial. I want to do something interesting and new and not just create a “Basic B” bathroom. 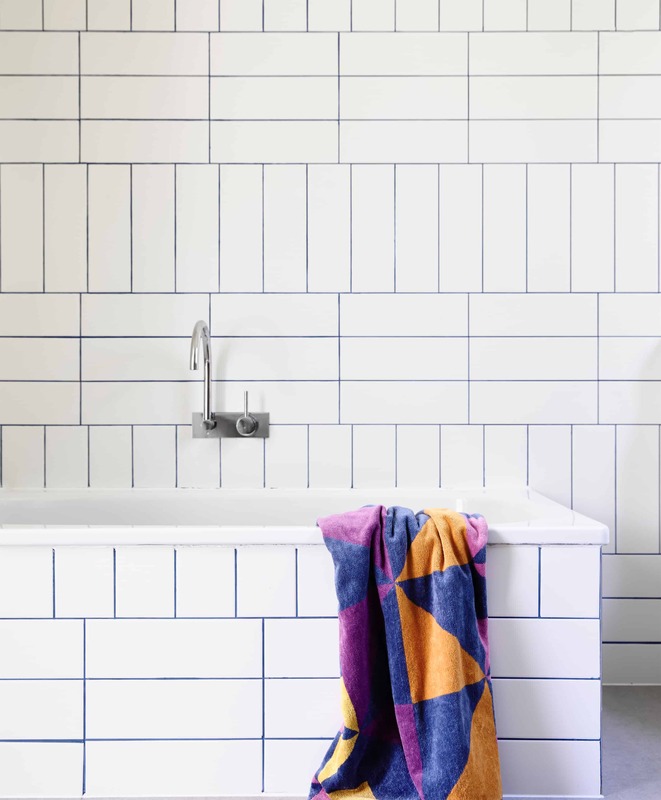 So I’ve been peeling back the layers of Pinterest, looking for bathroom tile ideas that catch my eye for what we can do with really simple shapes (subway, square, etc.) to make it feel special and new, but not so risky that it will make the bathrooms feel instantly dated. I have a few ideas in my mind, but a thought does not create an inspiration image to validate my thoughts. There have been a few trends I’ve noticed creep into my feed and magazines lately that I want to talk about because I’m intrigued by them and curious what your thoughts are on them. When done right, it feels simple, but intentional and gives a big dose of drama. The bevel edge of the tile catches the light really nicely and adds something a little extra to a classic black-and-white look. This one is more like an ombre which is definitely more of a risk than I’d take and isn’t totally appropriate for the house. Now, I agree that some of these will be more dated—the penny tile version above is so cute but is definitely A LOOK. I would likely mix white with blue (duh) of the same tile or at least from the same manufacturer so the finish is the same but maybe the scale would be different. I also like the idea of doing the bottom half of the wall one color and the top another, but you could do something like the above where the walls alternate, too. Also with that version, you win a puppy, which certainly adds interest to your bathroom. For the above, I might have done a large-scale floor tile, but the stacking green square with the staggered vertical rectangular white is an unexpected combo and gets my wheels turning. Or you just change the shade of the tile and it can help create some separation or give it a visual break. The overall vibe of this shot is really contemporary, but I think it could also work in something less…Euro. You can go even bolder with the above and below, but we wouldn’t for this house…I promise. 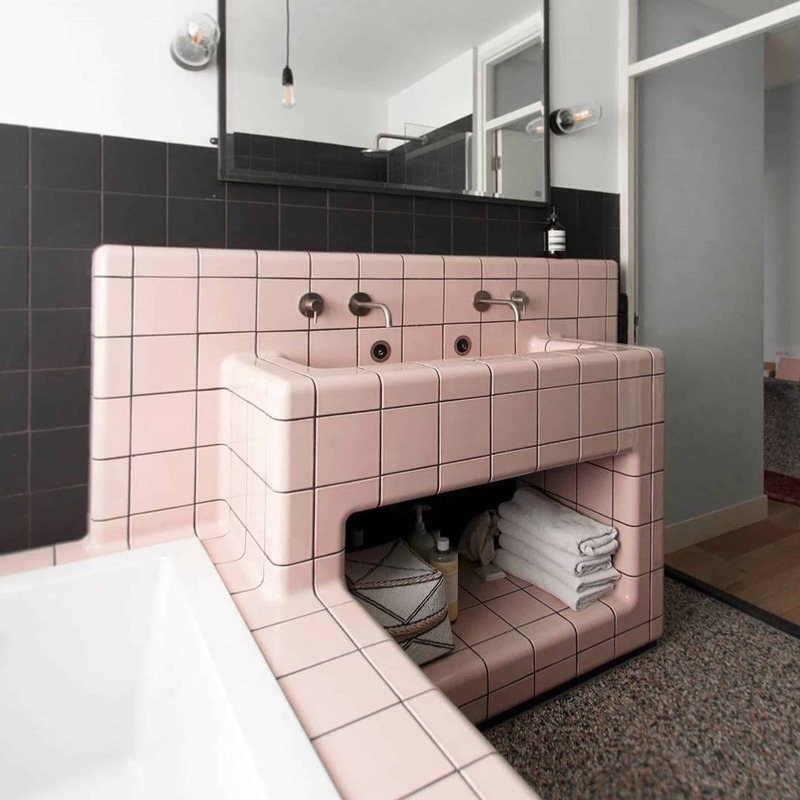 This is awesome for a hotel or a new build, but I am far more likely to do a vertical stack of one color, then switch to another, almost like a wainscot but in tile. This might make you go WOWZA, and yes, it’s OTT, but it’s a good example of creating something totally out of the box with something as simple as colored square tiles. Again, another idea that might look cool in a photo, but I’m not necessarily considering. Something with this many colors isn’t right for the mountain house, but in a more commercial setting (hotel, restaurant), it’d definitely get me to stop and stare. We are also thinking of sticking with the same tile, but switching the scale or the direction of them to do something unexpected. I love how they mixed the scales on the tub and the direction on the wall, but I can’t help but wonder why the lines aren’t lined up. And yay, for blue grout. I think that it’s too contemporary for this house, but I love looking at it and trying to figure it out like a puzzle. When done more simply, like the below, it’s hard not to like it. The key to this working in this house is to use handmade tiles (to ensure warmth) and keep it simple with just two different tiles. The first photo by Magnolia Home is by far my favorite and the one that references what I’d do the closest. So what do you think? I don’t think that when done simply, it’s a super obvious 2018 trend. Some of those are obviously too contemporary for this particular project (what with the rustic fireplace and ceiling) but imagine handmade white tile stacked vertically then horizontally…I think it will absolutely work. Thoughts? Feelings? Suggestions? Yes to this trend or NO? Interesting! I noticed they were different size and orientation and liked it. thats funny it was an accident … i like it. It’s also dry stacked (no grout). I can’t help but wonder if water wouldn’t seep in behind???? I was just in an awful b&b, but the tile in the bathrooms were so cool to me – from the 1800’s – dry stacked, no beveling, just flat tile and it looked pretty rad. Also, the new issue of HB has a kitchen with a pink quartz tiled backsplash in a kitchen (she said she wanted it for the counters but it was too expensive so she had it cut to rectangular tiles for the backsplash which was also unexpected, yet still classic and I think more evergreen. I second this question! Dry stacked is gorgeous and pastoral, but I worry about the practicality of it. Yes, how does that work in a shower?? How do I watch this? I want to see! The only two I like is the one shower with the arched entrance and this last one of a restaurant. The other patterns do seem trendy to me. I love the photos in which the tile color is the same, but the scale and pattern are different. The color blocking does not work for me at all. I looked over them a couple of times to try and figure out why and I think it’s because they remind me of locker rooms in schools and gyms and bathrooms in institutional buildings. Particularly when done with square tile. 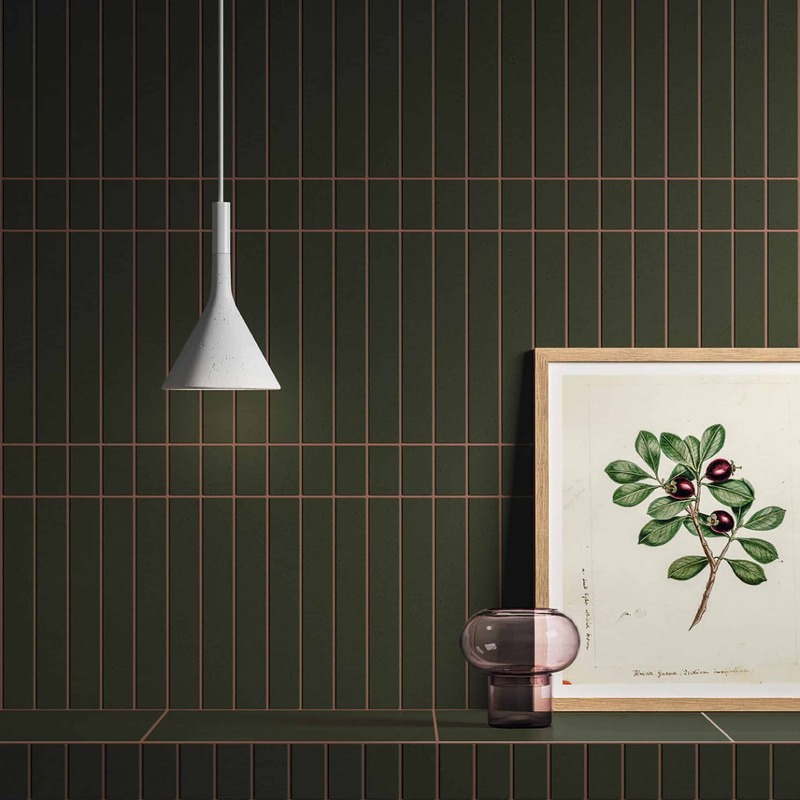 My favorite is the dark green tile – long vertical strips with little squares. It’s simple, but really different and completely stunning (to me). But you always do such beautiful work, I’m sure you can make color blocking stunning too. That dark green one is my favorite, too. I’m already planning on that color tile for my master bath renovation, it that grout color and size variance is fantastically inspiring. Yes, there was something about them that didn’t work for me and I think it’s because they remind me of my highschool bathrooms or the local pool locker rooms. I agree. they go super 70’s locker room. I’m avoiding square tile in general because of that for this house. The first one and the green one are my favorites as well. Yes! A lot of these look very institutional. My favorites are the photos in which the tile is all the same color, but used to create a distinctive pattern. 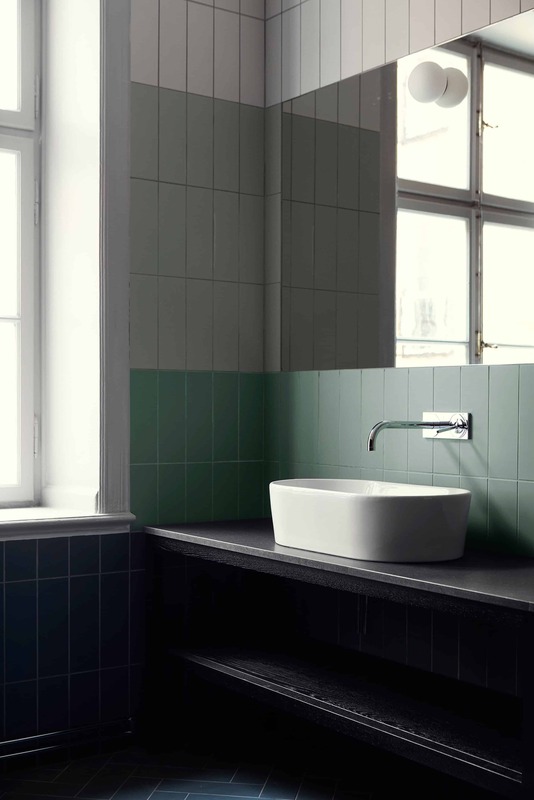 I didn’t just like the dark green with long vertical tiles mixed with little squares – I think it is absolutely stunning. The color blocking does not work for me at all. I looked through the photos several times to try to figure out why and I think it is because it reminds me of locker rooms and hallways in institutional buildings. But, you do such beautiful work, I’m sure you can make color blocking stunning too. The dry stacking is really bothering me. Seeing the sides of the tiles looks like mildew to me and makes it seem dirty. Might just be those specific tiles. Other than that, I like the look in that particular case and the dark green vertical long tiles with the smaller tiles. I’m not a fan of any of the other layouts on this post. To echo what others said, it feels very institutional to me, not like a home. what is this ‘dry stacking?’ does that mean without grout? INTERESTING…. Dry stacking is, indeed, without grout, and when installing tiles without grout, you need to make sure the tiles are tightly stacked together so the thin set won’t slip in the grout joints, which can be a tricky installation because of that. In addition, you would not have dry stack in a wet space. Since this is a bathtub it works, whereas in a shower it would not. 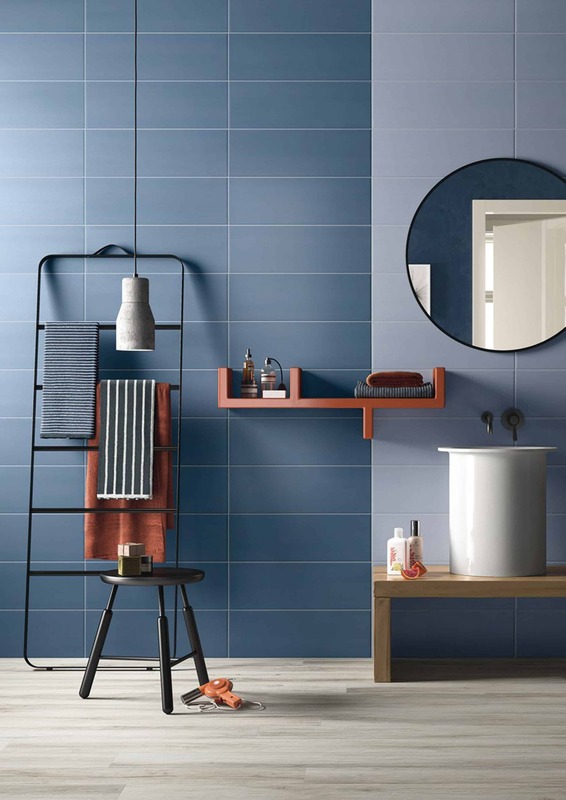 These are zellige tiles by cle tile – absolutely beautiful and a great company to work with. 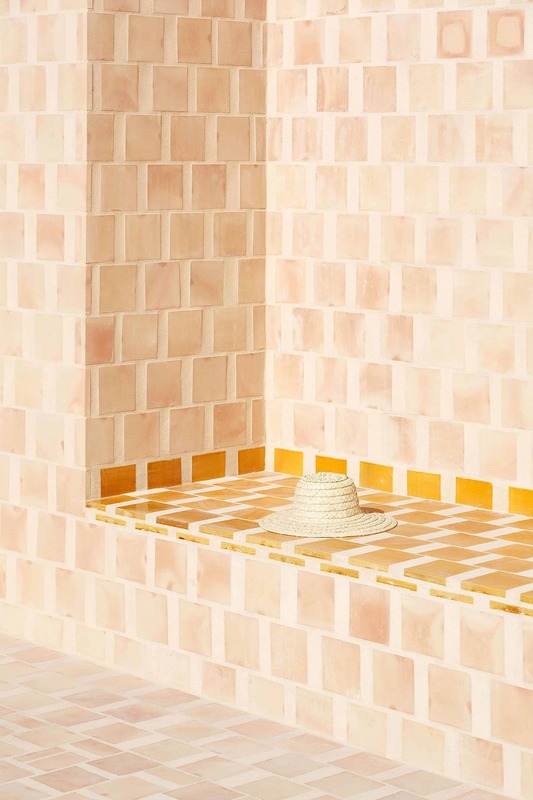 I wonder if another (albeit, expensive) option would be to use Tadelakt plaster as a base so it’s already waterproof underneath before stacking the tile on top. Although if you go through the expense and labor of Tadelakt plaster, I would leave it exposed. It’s a spectacular (and waterproof) finish! Are there companies who do tadelakt in the US? I was trying to do research on that awhile back and couldn’t figure it out..love love love the dry stacking! It’s amazing, looks so rustic! I’ve never heard of dry stacking either! So interesting. It looks like you could get a similar look with very small (1/16″ or smaller) grout lines, plus grout color similar to what this photo looks like (dark blue on the bottom, brown-ish on top). Digging the color block trend. Not as sure about the second concept. Check out the bathroom of the Garrett Room at the Hotel Emma in San Antonio. 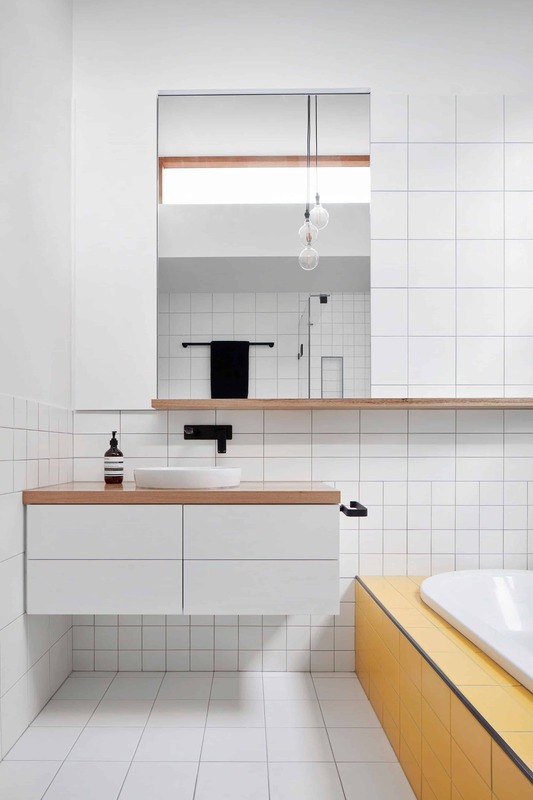 It’s not right for your house, but I think it’s a good example of a bathroom that doesn’t look super 2018 but still colorblocks beautiful tile. My favorite from the above is Magnolia too 🙂 Love the idea of white on white in different directions with handmade tile! I am all over the tile in the first picture (it also appears as the last pic too). A complete stunner with longevity. It just feels like perfection to me. I can’t get enough of the organic looking clay tiles with irregular edges and the brick tiles. Regardless of what you choose for pattern or color, I’d love to see you use those. My brother had bedsheets in the 80s just like that “Wowza OTT ” kitchen with all of that red and gray and white. Eek it all just looks so very 80’s to me having been a child during that time. Now the thing I don’t like about the Magnolia tile is all that grout just feels dirty. There’s something sterile and also dirty about all of it, not my cup of tea for sure. Color blocking is too trendy, period. agree. there’s something about certain grout/tile combos that makes me itch. i think it’s because when we travel, our routes take us through many mountain tunnels. They all have square tile with dirty grout and it just looks….very mountain highway tunnel. But that’s just me. In general–I haven’t been all around the US–but, my head can only picture all of these in Miami, FL. Otherwise, I think they’d be really tough to pull off! I do like that rich green color and sheen though of the first picture! And the color scheme of the arched shower is pleasant to look at. The only one I like is the first/lady picture and I think its cause without grout lines the change in color and direction doesn’t feel crazy busy. I don’t know how it works in practice. Wow… the tile in the first picture is beautiful. An old-world mood setter. I love the shelf/towel bar. I really love that particular tile also. The color blocking is less attractive to me than the other option (though I don’t hate it, it would really depend on the colors). The Magnolia example is absolutely gorgeous (looks like it’s old and has been there forever!) and that green tile a few pics above is swoon worthy. Yah I agree. the house was built in the 60’s so I can’t go too old world. But I LOVE a zellige very very much. Please tell me a post is coming with Emiy’s new colors! I agree with the comment ‘reminds me of my high school bathroom or the pool locker room.’ I think the only photo I love from above is the first one with the handmade tile. I’m not loving most of these…and scrolling back through I think the biggest perpetrator is the grout color moreso than the tile color/orientation. I have never been on the dark grout train, so only the lighter grout tiles remotely appeal to me. I feel my eye not even noticing the color/orientation. However, that dark green with terracotta colored grout??? Hmmmm that feels warm and earthy and clean and modern, without going ultra contemporary. For sure my favorite out of the bunch. But again, I think it’s the interesting grout choice that captures my eye over the different tile shapes. I agree, the dark green matte tiles with terra cotta grout is spectacular. I think the tiles themselves are so sharp looking, then that earthy contrast. Yum. I’m not really a fan – the only two images I actually liked were the dark green tile with rose grout (very simple pattern and still soothing) and the leading photo with the traditional color scheme (though that decayed grout look made me cringe). For the most part it either looks too hard-edged modern or brings too much energy into a room that I prefer to be serene. 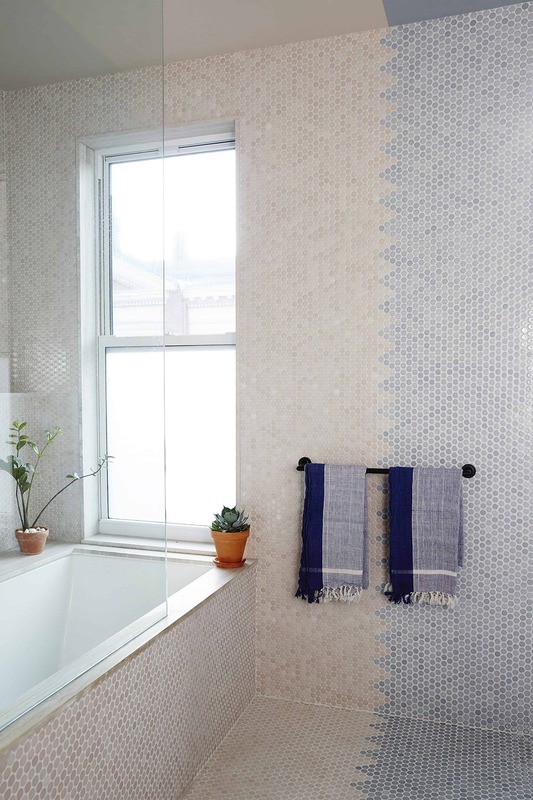 Mixing tile direction and scale could work in a rustic minimal space if you used handmade tile in one color. There’s something rustic about mixing size/shape/scale, like an inspired use of leftover materials that ends up perfectly imperfect. I love all these examples, but I see what you mean about only some of them working with the cabin. I think you could keep it sleek and understated by keeping the same width for all sizes, and the proportions symmetrical. 2×2, 2×4, 2×8 with both vertical and horizontal orientations. That will create a lovely rhythm. Don’t throw any 2×6 or 4×4 in there if you are going for sophisticated restraint. Color blocking – for editorial purposes, go for it. Reading through these comments validated that I’m not alone in my sentiment that I don’t like most of them! When scrolling through, I couldn’t figure out why and now realize it’s because of what another commenter said- the locker room/industrial vibe is not my thing. I also don’t like tile all the way to the ceiling in areas outside of the shower. It just is too cold for me and makes feel like you have to scrub the walls too or else they will get mildewing. I do love the colors of the first one, but the lack of grout makes something brand new look old and dirty. Let’s drop the white, grey and black and move on to Color. The world is full of it and alot of people actually know what color they like. And now we have tile in beautiful patterns and colors. Wake up world you’re not dead yet. Oh, and even grout comes in colors! These would all be a hard no for me. Too trendy. Might be fun for a hot minute, and then you would get sick of it? Also, this is going in a mountain house. Not a modern, clean-lines, contemporary house. I think there are places to take risks, like your kitchen, with all the wood cabinetry hiding the appliances. But I do not think that any of these would fit the bill in a mountain home. I do love hand made tile, though. Have it in my bathroom, and I LOVE it so much. But, it is in a boring white subway tile style. But it feels so right in my Cape Cod style home. I like all those versions of mixed blues and whites, and the shape variations in the one with the navy blue shower. I agree with others…. I’m not in love with a lot of these. I think a lot of the photos feel busy and chaotic to me, especially the ones where they’ve mixed a lot of different shapes, colors and directions. Tile direction/size-wise, I like the ones (like that dark green one) where they’ve used different shapes but lined up the grout lines so that there is one continuous line for my eye to follow. Color-wise, I’m more drawn to the ones (like the subtle blue and periwinkle one) where the color-blocking is done more like an accent wall than a wainscoting. The magnolia one just brings flashes of dirty motels that you’d immediately turn and run from. Whatever is going on with the grout or lack there of is just wrong wrong wrong. The color and irregularity of the tiles and how they are laid is beautiful and would fit into a mountain home setting but the lack of grout makes me cringe everytime I look at it. The tiles themselves remind me of your kitchen tiles. I just said the same thing. I can’t stand the dirty look! Ewww. I have to be honest and say that I’m not really a fan of most of these images. The first image is beautiful, but it seems like it would be more appropriate in an old home in Europe. The image with the dog seems more doable in a mountain getaway home. Otherwise, they feel a little too institutional and trendy. You have such great taste, I’m sure whatever you do will be fabulous! I love so many of these. Such creativity! Really inspiring. Many are too 80s for my taste, but it really gets you thinking about all of the ways you can play with tile. I will say that I hate how the 1st photo (Magnolia Home) looks like dirty/missing grout. I just could never get on board with that and wouldn’t like to visit a home with that aesthetic. The tile itself is very pretty but I hate how shabby it looks. It just feels really dirty to me. Okay for hospitals or banks, I suppose. But, they are all pretty ugly, in my opinion. Nothing beautiful about any of them. I’m laughing thinking about asking a professional tile setter to “dry stack” shower tiles! I shudder to think of the mold, mildew, and rot that will follow. Something about those handmade tile drystacked makes me shudder. I felt that way when I saw them on the TV show. They are not for everyone at all. Concerned about the no grout situation. Looks like a place for mold to grow. I really liked most of these and think you could easily incorporate their inspiration into the cabin. The rustic cabin. The black and white bevel is beautiful: a fantastic riff on a tiled wainscoating. The dark green with rose grout is breathtaking. Very inspiring and glamorous. And the restaurant with the black and white colorblocking with the wood and leather and floors is so good! Has me majorly inspired for the overall feel of my own home. Your handmade tiles, layed in a fun new way will blend rustic and modern and remain timeless. Honestly…I’m not crazy about any of the looks. I guess I am old school and think you should do something timeless and classic. White/cream and bring the color into the room with the wall color and rustic/mountain-cabin accessories. Most of the photos you showed us are very trendy and in 10 years you will be ripping it out, wondering “what was I thinking. Trendy is not timeless. Please don’t think about tiling the countertops…that is so 1970’s and 80’s…we just big bucks to rip out that look in all of our bathrooms (our house was 1986 build) and now have nice neutral quartz countertops. That picture with the pink tile countertop was horrible. Love that top photo with the dark and light blue in different orientations, but have a random question. Obviously you didn’t do it, but in your professional opinion what do you think the grout situation is there? It looks like there isn’t any? Is that possible? The tiles were dry stacked which is installing the tiles without grout. When doing so you need to make sure the tiles are tightly stacked together so the thin set won’t slip in the grout joints, which can be a tricky installation because of that. In addition, you would not have dry stack in a wet space. Since this is a bathtub it works, whereas in a shower it would not. These are zellige tiles by cle tile – absolutely beautiful and a great company to work with. I agree. Updating a classic tile design with a modern twist (change in direction) will work well without becoming quickly dated. I like the photos where the same tile is in two colors and two directions. Once you add more colors, shapes, or directions, it becomes too much for a home environment. I particularly prefer the long thin rectangular shapes. 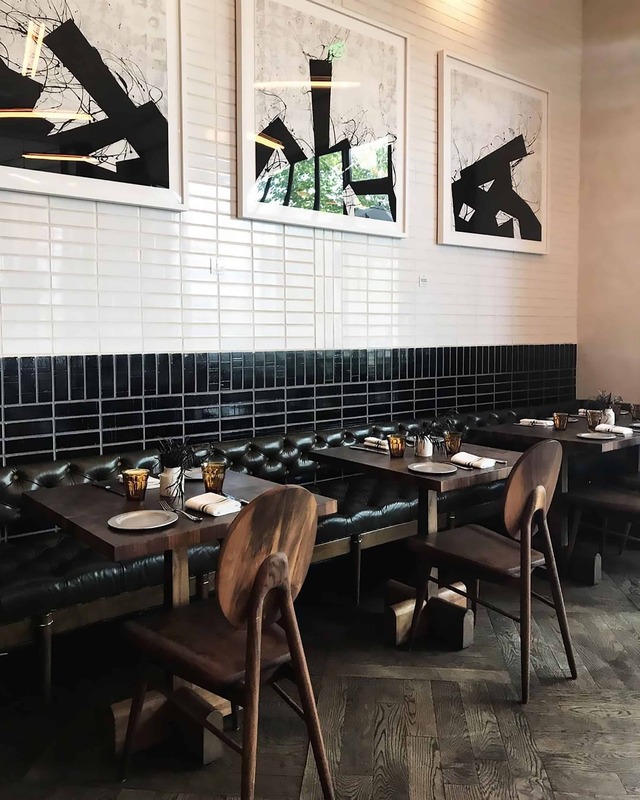 The dry stacked tile installation definitely looks vintage whereas a matching (or neutral) grout look is more appropriate for the era of the mountain home. I’ve wondered whether you’ve considered Pewabic tiles (or Motawi, inspired by Pewabic). Probably too expensive. 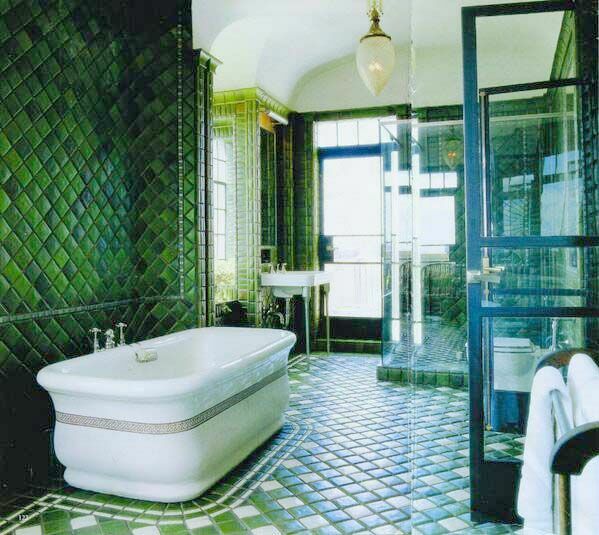 But when I think about gorgeous bathrooms I always go back to the Jed Johnson bathroom with Pewabic tiles. From my perspective, none of these examples leap out to me and say that they are a mountain cabin vibe. They are more of trendy vibe or they are contemporary. I don’t know if one would tire of seeing these dark colors. Is there any inspiration to be drawn from the adjacent rooms or from the outside vistas? With the dark tile, I have heard folks says to be careful since the water can leave mineral spots over time. (Maybe some one who has had dark time for a time could address whether there is any issue with water minerals staining tile.) And, if you are on vacation, who wants to wipe the water off the tile. The Fixer Upper image is by far my favorite, but I also really liked the dark green with short pieces and very long rectangles in the same width. Most just don’t seem like they would fit the over all style of the mountain house. Sorry, don’t really love any of these. I think you can do better – you always do! partial to blues and greens, so first photo with green tiles seems very calm and dare i say a touch of vintage like what is seen established homes. love it. Not feeling it… I like the first pic with the handmade tile, but some of the others look like a tile delivery truck vomited all over it. Like the first two and the green with the terra cotta grout. Other than that agree with the other commenters – too busy and chaotic with all those grout lines. In Gil Schafer’s latest book, A Place to Call Home, Rita Konig did the kitchen in a California cottage in Mill Valley with a variation of this idea. She used wide horizontal shiplap on the bottom third and narrow vertical bead board on the top. It’s on page 108 and might be the look you like but much cleaner. I dunno…all of these seem like they will go out of fashion very quickly, even with neutral tile colors. Maybe it’s the tile size, but I’m not feeling them. Although that dusky blue two tone…GORGEOUS. Love that one! No more subway tiles, please!!! It’s been so overdone and an ugly reminder of public restrooms! Don’t really care for the dry stacking. The exposed edges would always look dirty to me. But I DO love the tiles. I also like the the bathrooms with two similar tiles, or the same tile but used in two different directions. And the blue grout was awesome! Those handmade tiles in the first picture and the next-to-last are stunning, without doubt. But, call me crazy, I don’t want to have to try and clean the soap scum from around those uneven edges! Generally don’t like it, but that Magnolia one is SO good! I think white on white could be really pretty. 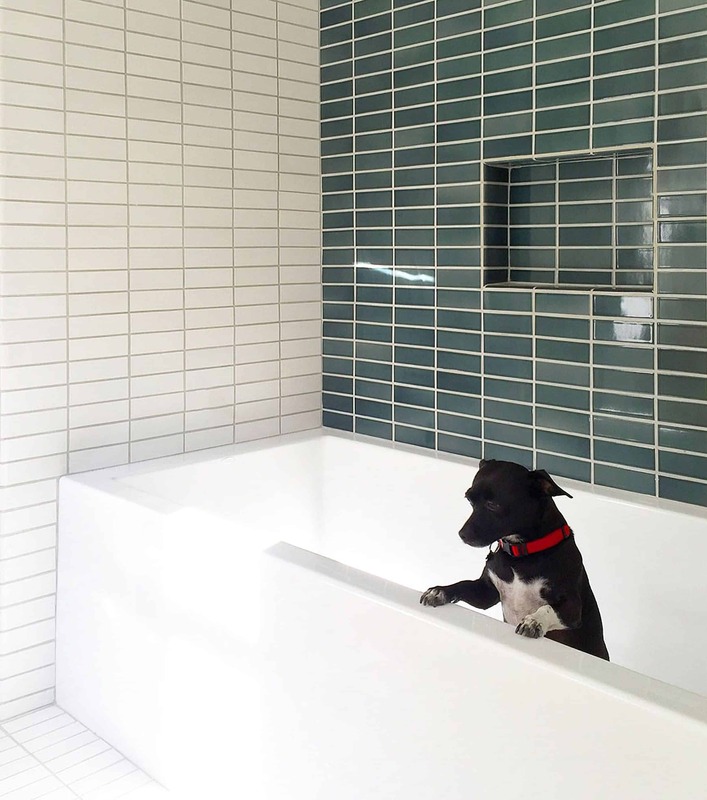 I like the idea of an all tile focal wall by the tub (handmade tiles). Not a fan of the all tile bathrooms, because it is so hard to change anything mounted on the wall. I prefer accenting high water zones with tile. Also I’d prefer to repaint a wall then scrub grout or repoint grout. Do it like the last picture, but all the same color. Interesting to me that so many people are not into this! I think it’s awesome! Granted, it’s all about the RIGHT space, but I don’t even mind a high school bathroom reference. So? Love the color blocking one! Love the first one and then the blue and gray. Two totally different looks but I love them both. I find all of these unappealing and not well-suited to a mountain house. I love amazing tile work, both in manufacturing and installation, but these images are not attractive to me. Dark grout in a bathroom looks dingy to me. I am not a fan of it. Very few of the tile inspiration photos do it for me regarding your scandi mountain home. It just isn’t right. And yet, you will pick one and somehow I will stare at it and think, “maybe I love it?” You somehow manage to always make it right, but from the stands, I am hollaring “NO WAY!” on this one! I just don’t think you have hit the nail on the head yet. The handmade tile adds interest and keeps the look less contemporary. It is earthy. I like it. 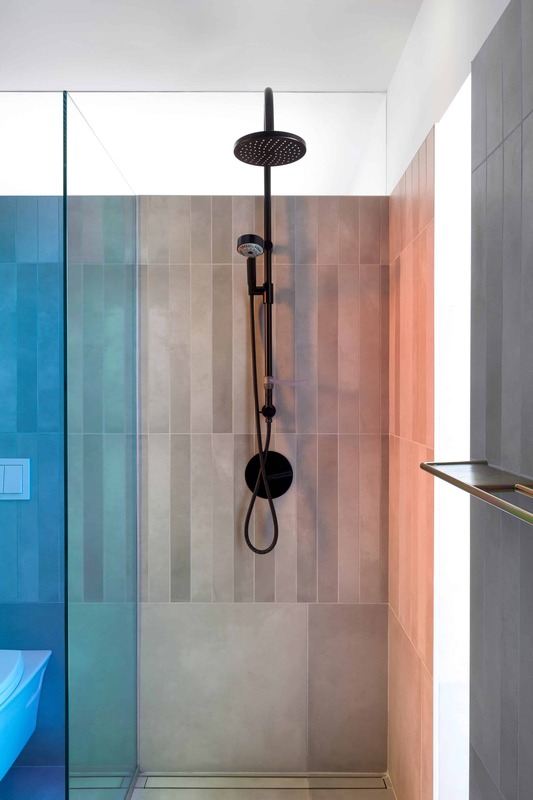 The last photo in your colorblock section, with the gray tile and black showerhead, is actually all the same color tile all over, just with reflections from the glass casting different colors onto it. I actually love that example when focusing on the single color of gray. Definitely in the camp that prefers keeping one consistent color and changing up the size/scale. Or, if using two different colors, going with the accent wall option as opposed to “wainscoting”. I agree with a lot of these comments that the colorblocking can lean very industrial and just doesn’t feel as appropriate for the style of this house. 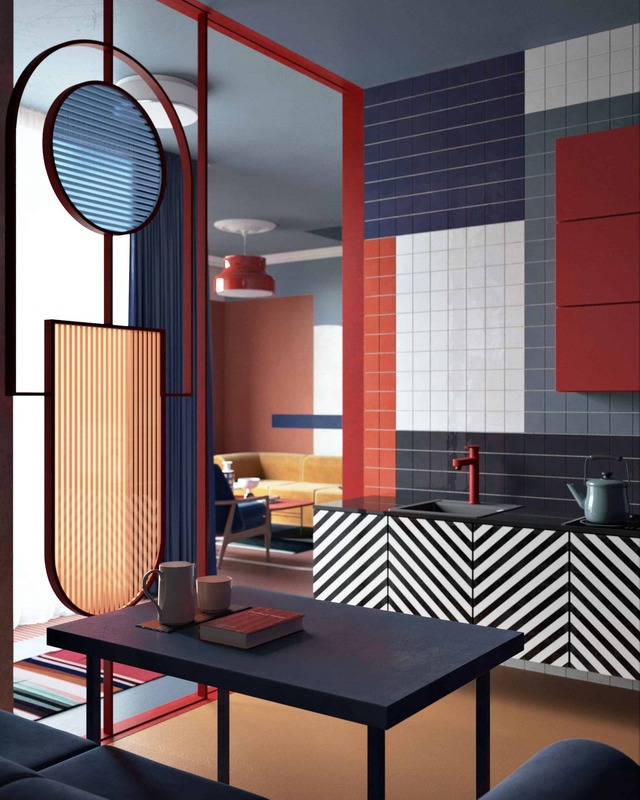 I love that first inspiration image from Magnolia home and the last image of the cafe, but other than those examples, I think the color-block tile look is very Saved by the Bell. I think what makes the last two images work so much better than the rest is that they are very organic looking tiles and it’s not grout-focused. I’m hoping that the mountain house remains refined yet organic and doesn’t go too 90s. I do love a good contemporary pop color tile, but not for the mountain house. I like the Magnolia Home photo, but it doesn’t feel right for your house, imho. 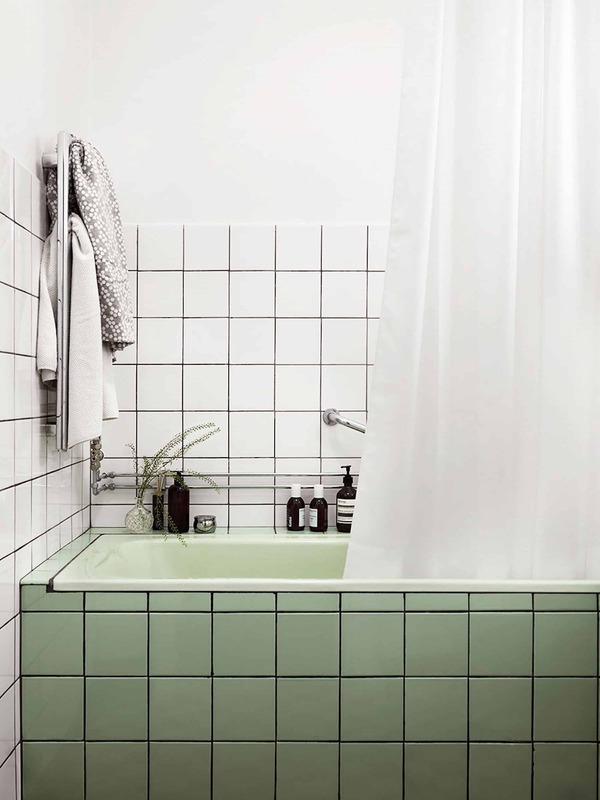 The inspo photos I liked best were the green tiles w white pendant (restful) and the super colorful one (fun). The more I look at these photos, the more I notice differences in grout lines, etc. It starts to bug me! I just really like the Scandinavian vibe and don’t care for glam or hotel-like looks. I really WANT to like these because I like the idea of seeing something new and different, but I just don’t love them. It’s like my eye keeps stopping, trying to figure out the why of the pattern change. And then I’m analyzing IF I like it or not, rather than just responding to it as a whole. Hard pass on all. 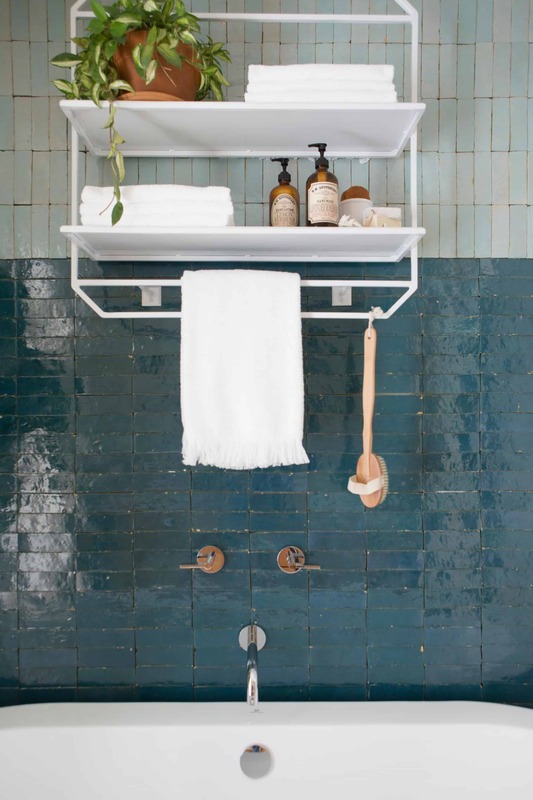 The blue tiles are gorgeous, but like others have said, they would feel more appropriate in an older home. I think the idea is pretty polarizing – you’re going to have some potential buyers that would really hate this idea. This is very interesting! I absolutely love the black and white square tiles from the first colorblocking tile picture. Can already see these in my bathroom with some touches of green 🙂 Vertical tiles are also something I have been coming across more often, though I’m not sure yet if I’m a fan.. only one I liked so fan was the last image here: https://mykukun.com/expert-tips-help-choose-best-bathroom-tiles/ but might just be the bold colors of that bathroom that speaks to me.. Absolutely love the black and white square tiles of the first colorblocking tile picture. Can already see it in my bathroom with touches on green, love it! Vertical tiles I have also seen a lot these days, though I’m not sure yet if I’m a fan.. Can’t get used to it somehow. 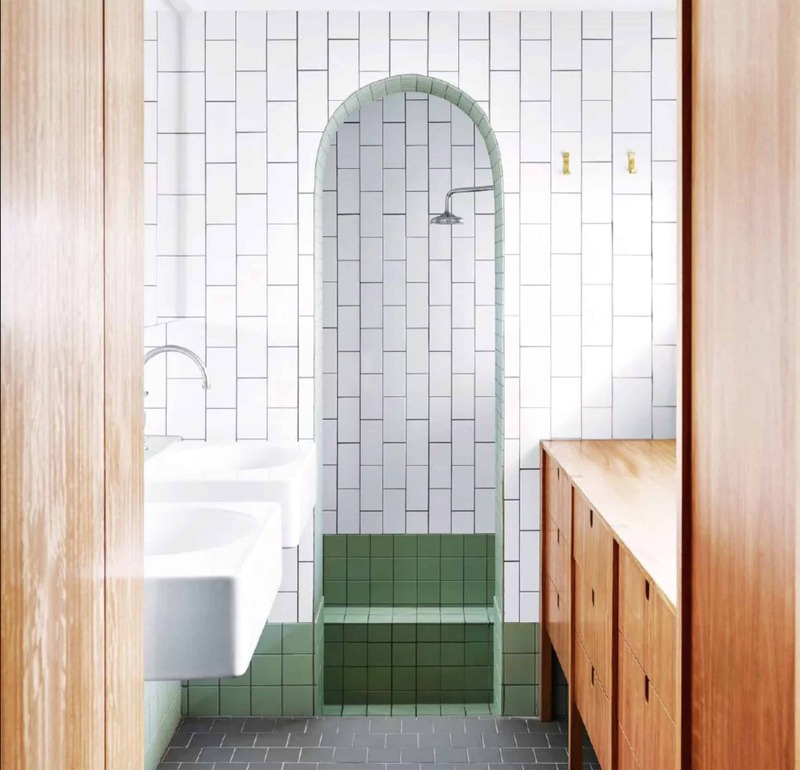 Only picture where I liked vertical tiles so far was the last image here: https://mykukun.com/expert-tips-help-choose-best-bathroom-tiles/ but it might just be the boldness of the whole bathroom that I really like..
It’s not my favorite image (agree with most of the other commenters on the dark green choices being best), but I like the idea of the “baseboard” blocking better than wainscoting. It’s not as busy and distracting. I think you could make that work using less institutional looking tile. 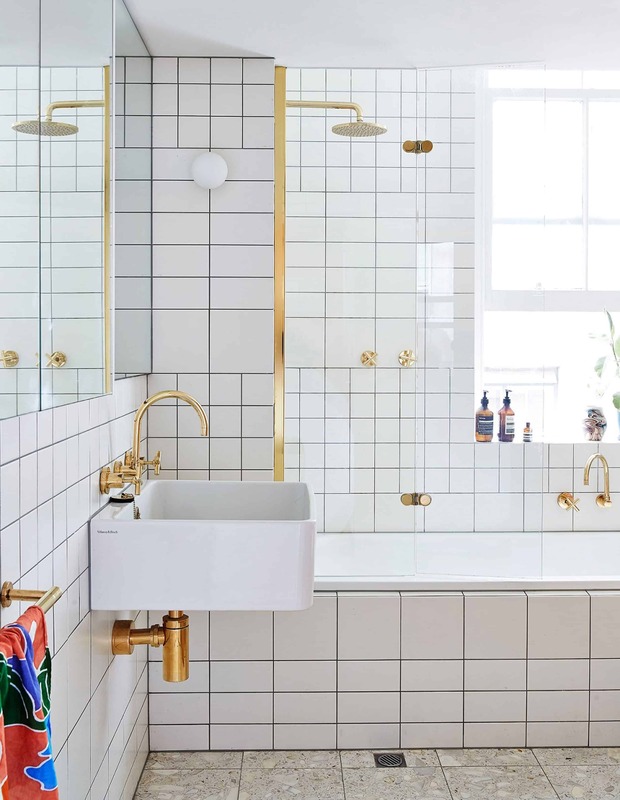 I am so in love with what was done in the “safe gamble house” master bathroom, that I am also recreating it in a project I am working on currently. It’s a modern farmhouse and the tile we are using is the same scale, 3 x 12, but has a grunge / oxidized look to it. So excited to see the end result. And Emily, I can’t wait to see what you come up with. Thanks for always being such an inspiration.